You're looking for a feel good story. From Goodreads.com: "This is the heartwarming story of Wallace the pit bull and Roo, the man who adopted him. Fate led the unlikely pair to the world of competitive dog Frisbee, and despite numerous obstacles, Roo and Wallace went on to become world champions." I'm not sure whether or not it shines through in my reading selections but I am a huge animal lover. I haven't met many animals that I don't like. Right now, I have two kitty cats (Winston and Totoro) but growing up, I always had cats and dogs (sometimes fish, lizards, and turtles too). My schedule right now is not conducive to having a dog right now and it makes me so sad. I have been loving stories about dogs lately because of that. Wallace definitely fit the bill. 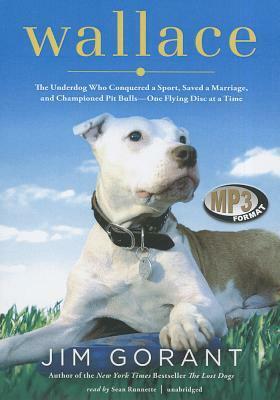 I loved this story because not only is it about a really awesome dog overcoming the stereotypes of its breed (pitbulls can be nice dogs. Bad owners make bad dogs), it's also about how dogs and all animals really can make our lives happier and better. Wallace's owners turned Wallace into a great flying disc catcher (something that bully breeds are normally known for doing well) and using his successes to shed light on this breed that has had its name run through the mud so much lately. This book is a great non-fiction book for when you are looking for something that's heart warming. This book was so touching. The end definitely made me a little teary! I listened to this book as an audiobook and really enjoyed it. I thought that the audiobook format worked really well for this book. Bottom line: A heartwarming story for my fellow animal lovers!